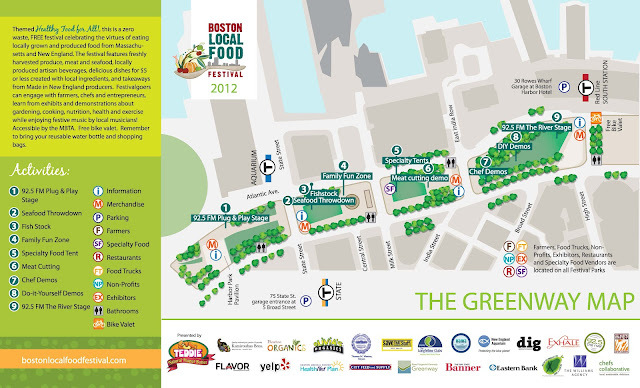 The Boston Local Food Festival is TODAY, SUNDAY OCTOBER 7 from 11-5 at the Rose Kennedy Greenway. I've volunteered for the last two years and am on my way there to help out again this year, but wanted to get this post out because if you're in New England, this event is not to be missed! The FREE festival is Boston's premier food festival promoting the joys of eating local food and includes local farmers, some of the best restaurants in New England, specialty foods, Fishstock and a “Seafood Throwdown”, Meat Cutting Demos, Chef Demos,a Family Fun Zone. and loads of local live musicians on the The River 92.5FM stages. The “Do-It-Yourself” (DIY) educational component allows amateur and professionals the opportunity to showcase their skills with festival-goers.